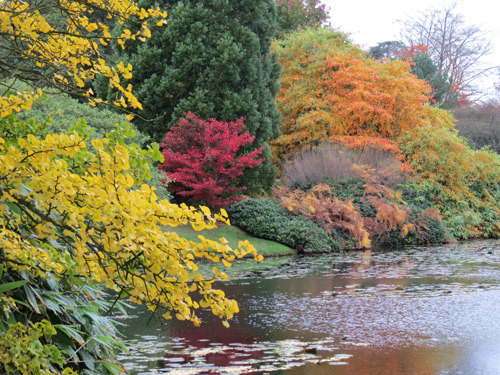 This week we went to Sheffield Park, near Uckfield in West Sussex, for our annual trip to admire the colours of the Autumn landscape. It was a very grey day - which of course is the very best sort of day for seeing the colours! It's always a bit of a challenge to get a sketch done here as the landscape garden is not over-endowed with seats - which is very odd as people are always giving seats to other gardens! 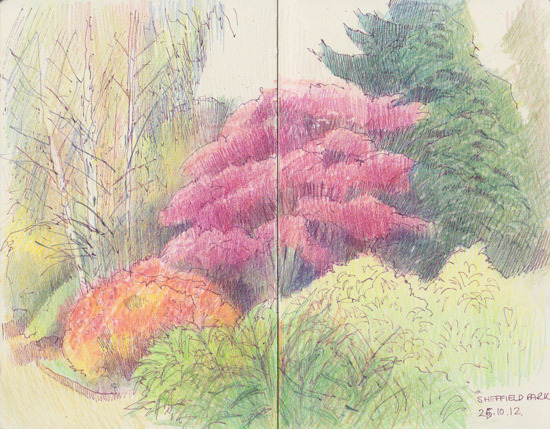 However we did manage to nab the seat to the left of the Cascade Bridge from where I did this sketch. I had planned to do more but it was one of those damp days where it's best to keep moving before I seize up! I'd not heard of the American Witch Hazel before but it was certainly putting on a good show with a variety of shades running from lemon through orange, coral pink and red. According to the RHS its correct name is Mountain Wych Alder (Fothergilla major AGM) and it's a member of the Hamamelidaceae (the witch-hazel family). 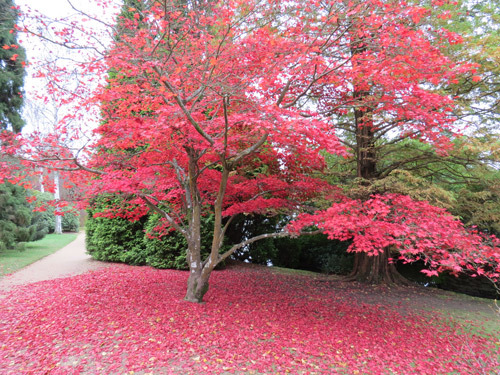 I forget which type of Acer it was - but it's one of those deep plummy purple red ones and in all probility it's an Acer palmatum 'Atropurpureum' (Purple Japanese Maple). 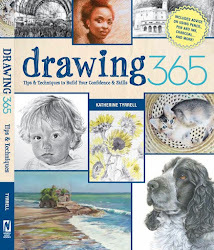 One thing I do know - it's incredibly difficult to reproduce the colours seen on the trees in coloured pencils! 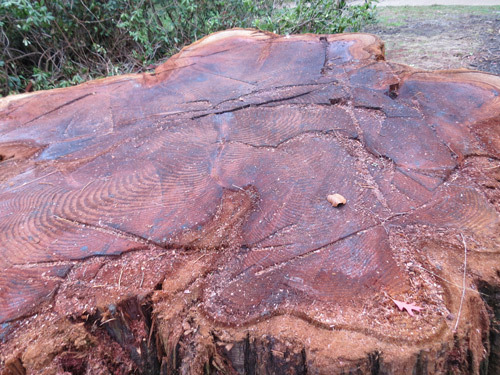 We also spotted what was left of the second largest tree in the garden - the Giant Redwood (Sequoia) which exploded after a lightning strike in January. If you've ever wondered what the inside of a redwood looks like - see below! 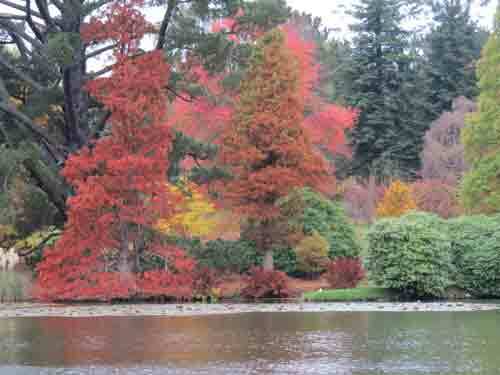 Here are some photos of the trees in colour - and some links to last year's sketches of Autumn at Sheffield Park. 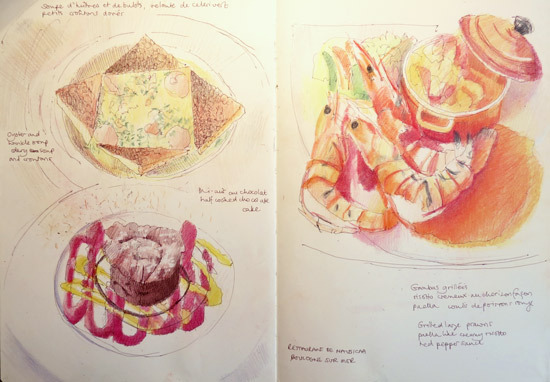 Two sketches from my trip to France last year - and my final french meal! I'm trying to fill in the gaps where I've missed out posting places I went to and sketches I did on my Painting in Provence trip last summer. Today I'm posting my lunch at the Restaurant Nausicaa in Boulogne sur Mer and the view from the window. This was the "get as close to the tunnel as you can and then stop and have a meal" meal! The idea was that I'd leave myself with half an hour's journey to the Tunnel and I wouldn't need to have a big meal when I got back home which would be quite late. Plus it was the last chance to indulge in French cuisine! They were delicious! I have a policy of eating one new thing every time I eat out in another country! Which is how I came to add a new food to my list of things I've eaten over the years - whelks (although I thought at the time that they were winkles). I checked the menu and only the sauce with the main dish is what's on offer on the menu today! Always good to see a restaurant that changes it's menu on a regular basis! I switched between drawing the dishes as they arrived and then drawing the scene out the window as I waited for them to arrive. 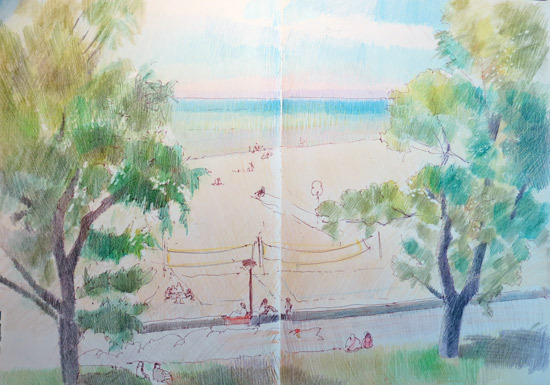 I was sat high up next to a big glass window looking out on to the promenade and beach to the rear of the Nausicaa Centre - which is Boulogne's huge aquarium. Small wonder that fresh fish and sea food featured on the menu! The restaurant is actually independent of the Centre and I highly recommend it as a stopping off place to eat in the Pas de Calais for anybody facing a long journey when they get back to Folkstone. It serves excellent food and does not keep normal restaurant hours. For the record the journey to the EuroTunnel was not straightforward as the satnav didn't understand the port and I missed the turning and then couldn't work out how to get back to the place where cars need to go to enter the Tunnel! Calais could do with some better sign posts! However it was nice to get back home and reach the end of my journey and a very long drive from Provence to London. 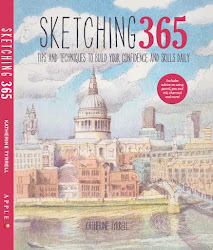 food sketch - this can be food in its raw form as well as food raw, uncooked and cooked. At the end of September I spent a weekend with my extended family in Shropshire to celebrate the Australian contingent being in the country and my cousin's 40th wedding anniversary of "the best wedding ever" on 30th September 1972! A house had been rented just outside All Stretton which had a wonderful view of the hills nearby. 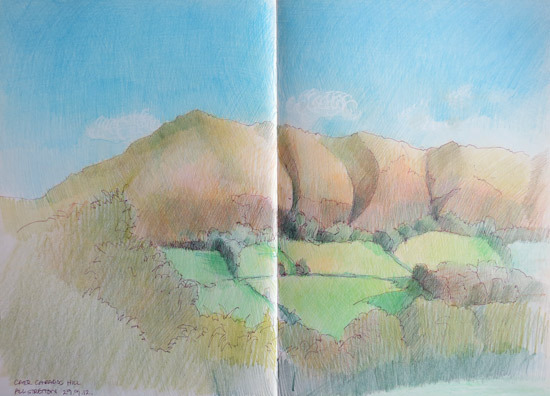 pen and sepia ink and coloured pencils in Moleskine Sketchbook, 11" x 16"
This is my sketch of Caer Caradoc Hill which I did late Saturday afternoon after my cousin's husband had climbed to the top in the morning. The hill is made of Pre-Cambrian rock (see page 3 of the link) and has a whaleback shape. It's approximately 459 metres or 1500 feet above sea level. From the top you can look north to The Wrekin, a hill in east Shropshire, look east to Wenlock Edge, a limstone escarpment just outside Much Wenlock and south west to the Long Mynd situated a little way down the road just past Church Stretton. On top of the hill are the remains of an Iron Age Hill Fort (see aerial view plus you can read more about the Iron Age in Shropshire). The hill is associated with Battle of Caer Caradoc in 50 AD. King Caractacus was a first century British chieftain of the Catuvellauni tribe who became King of the Britons between 43-50AD and led the British resistance to the Roman conquest. There are many legends associated with King Caractacus - also known as Caradoc - and one of them is that he made a last stand with his followers on this hill - which is now known as Caer Caradoc. He was defeated and Caractacus was taken, as a prisoner, to Rome. There he pleaded for his life in front of the Emperor Claudius - and got drawn by nineteenth century artists for his efforts! 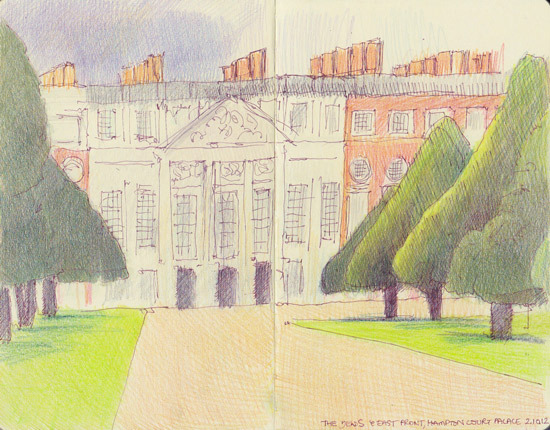 We recently visited Hampton Court Palace next to the River Thames in Surrey. I'd never realised before how easy it is to get to (via a train from Waterloo) or how huge it is in terms of the Palace and Grounds. We only covered about half of it in the time we were there and, since they're only closed on the 24, 25 and 26 December, I expect we'll be going back to visit again sometime soon! As we entered the gardens (this is a map of Hampton Court Gardens) I was absolutely stunned to see the simply amazing size and shape of the Yew Trees in the Great Fountain Garden. Apparently some of them are 300 years old having been planted around about 1707 in the time of Queen Anne. I gather the original idea was they should be kept tightly clipped but somehow over the years they just grew and grew until we have the amazing conical shapes we see today. 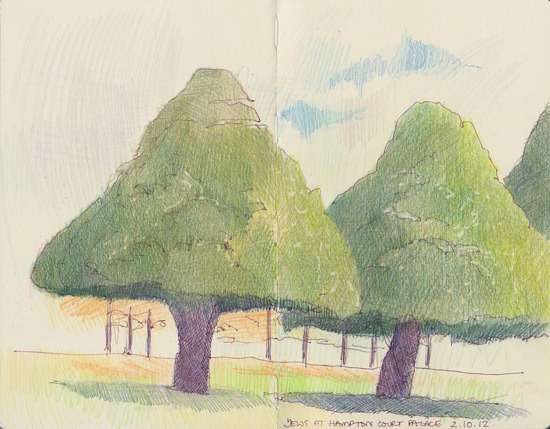 In this post you can see the two sketches I did while sat on one of the broad avenues bordered by the Yews which lead up to the Long Water - looking first one way and then the other. I've since seen other images of them and I'm already thinking about better drawings I can make in the future! 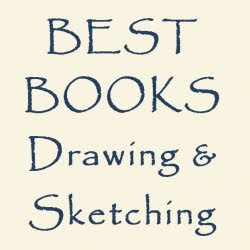 Plus what I want to sketch in the rest of the Garden! Sometimes I'm riveted and intrigued by the people I see in art galleries and museums when I'm sketching. 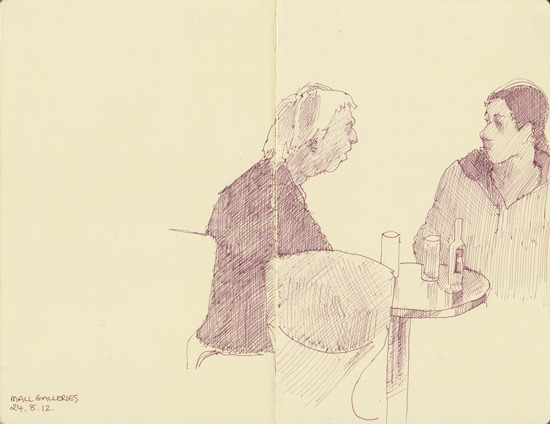 This was a very fast sketch - and it made me want to try and work out who they are and what they were talking about. Of course they could just be discussing which train to catch! to the Isle of Dogs and the new business centre at Canary Wharf. If you keep going past the tall office buildings at Canary Wharf you'd come to where I live in East London! 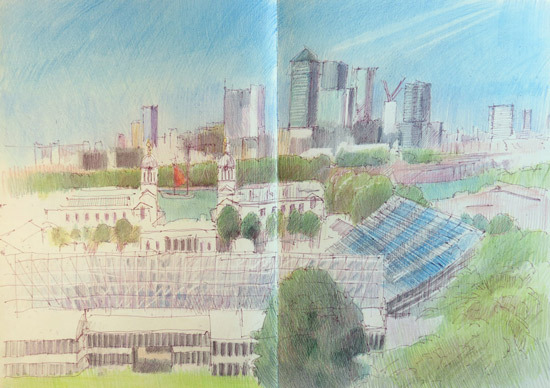 You can also see this sketch on Flickr where I've annotated it with the names of seven structures, places and objects in the sketch. You have to love your cursor over the picture to see the white line boxes which relate to each item which has been annotated. 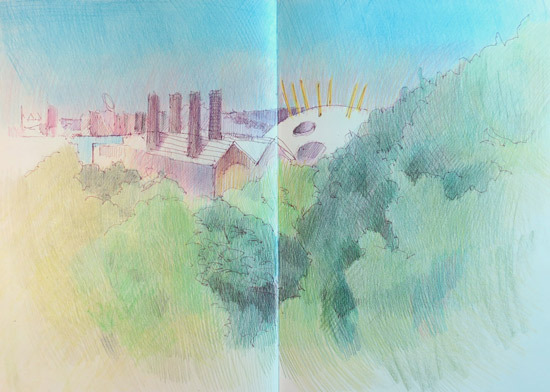 The Eastern 'downstream' section of my panoramic sketch is below. It's looking over North Greenwich and Stratford on the other side of the Thames. 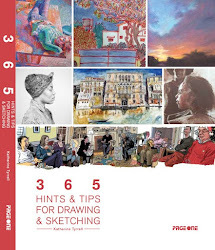 Ditto - the sketch on Flickr hows you what you can see - including the Olympic Stadium in Stratford. Move your cursor around the Flickr Version to see the annotations explaining the buildings - and see if you can find the Olympic Stadium!